August not only hosts National Marshmallow Day, but also National S’mores day! Come On! Could we find anything better to celebrate? Do you remember your first S’more? I think I have over glamorized my experience of this traditional campfire treat over the years! In fact I don’t think it was that great at all. Sitting on the beach sun burnt and freezing, covered with mosquito bites and then when I was finished strategically placing my chocolate onto the gram cracker I waited patiently for my marshmallow to get toasted. It was black and seemed solid when I placed it on the chocolate it squished all over me and the gooey hot liquid burnt my hand causing me to drop it in the sand! I have since had more successful outdoor culinary adventures, but I think this cocktail makes up for any unpleasant memories! Cheers! 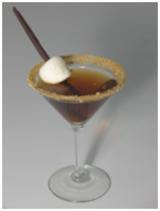 Dip the rim of 4 martini glasses in the chocolate syrup and then into the crushed graham crackers. Chill glasses in the freezer. Pour all the remaining ingredients except the marshmallows into a martini shaker filled with ice and shake until well blended. Skewer your marshmellows on a cocktail stick and place in the chilled glasses. Strain the drinks into the 4 glasses. Enjoy!